The Daily Mail (my favorite Paper of Record, if you hadn't guessed by now) is reporting that more than 1 in 4 mothers—27% to be precise—will hand her cranky or bored baby a cellphone—rather than, you know, something whose name literally means to pacify. But, while such a statistic to some may seem like an unfortunate sign of the times, this actually might not be such a terrible thing. 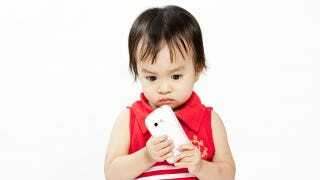 With increasingly many touchscreen and trackpad smartphones on the market, babies given their mother's phone to play with have the opportunity to begin developing their fine motor skills and hand/eye coordination at an early age. Of course there are all sort of educational apps available for toddlers and small children, too: puzzles, word games, number games like Sudoku, etc. Sure, too much technological stimulation can pose its own unfavorable effects—attention span being the favorite subject in this type of discussion. But, before anyone goes and writes off this 1-in-4 statistic as a maternal crime against humanity, or as just a real shame, perhaps we ought to take a look at these smart-phone babies, say, ten years down the line. It is possible that they will be better off.